Some so-called "Geological Material/s" (like Solid Rock) are incredibly tough in Nature, but others (like Piles made out of simple Volcanic Ashes) are quite fragile and "soft". 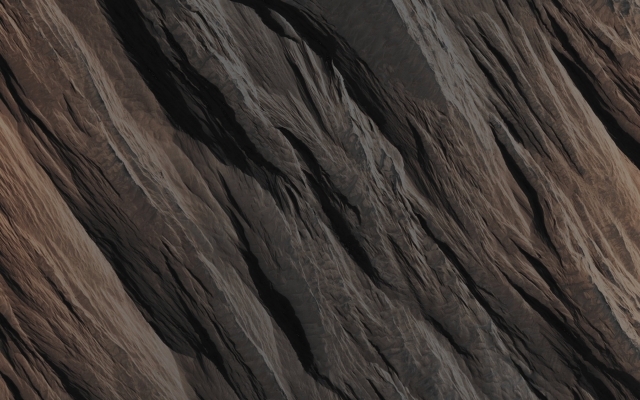 Some of the aforementioned fragile Geological Materials are soft enough that they can easily be eroded by the Winds' Action alone, and so they yield landscapes that look like the one that we can see in this HiRISE sub-image. The long and relatively straight Ridges visible here are called Yardangs (one of the three most common Aeolian Surface Features of the Red Planet - jointly with the Windstreaks and the Dust Devil Tracks) and they form (on Mars,as well as on Earth) when the Winds' Action strips away the "inter-ridge material" (---> such as the soft and fragile Geological Material/s existing between the Ridges). This process is greatly helped when the Winds are also blowing (micro-particles of) Sand along (---> with them). As a matter of fact, the Sand Grains do a strong and effective job at stripping away the loose Material, and therefore we can say that these Ridges were litterally sandblasted. Yardangs are useful Surface Features to recognize, because they possess a truly unique shape and, in addition, they can tell us the direction which the Dominant Wind/s is/are blowing in. It may take (we cannot be one-hundred-percent sure, but it is reasonable to suppose so) a - always relatively speaking - long time for them to form; however, if so, then they indicate us the direction of the Dominant Wind/s orientation averaged over a long period of time (which might be quite different than the one where the aforementioned Dominant Wind/s are blowing on Mars today). These Yardangs can also tell us that the Surface here is made up of loose and weak Material, and this information, in conjunction with other data, can tell us what the Geological Material is composed of, and what the history of this particular (---> specific) Site of Mars has been. Coord. (centered): 11,952� North Lat. and 199,841� East Long. This picture (which is an original NASA - Original Mars Reconnaissance Orbiter Falsely Colored and NON-Map-Projected Sub-frame identified by the serial n. ESP_040504_1920-1) has been additionally processed, extra-magnified to allow the Readers a better view of the details, contrast enhanced, Gamma corrected, and then re-colorized in Absolute Natural Colors (such as the colors that a human eye would actually perceive if someone were onboard the NASA - Mars Reconnaissance Orbiter and then looked down, towards the Surface of Mars), by using an original technique created - and, in time, dramatically improved - by the Lunar Explorer Italia Team.